The delivery of high quality mapping and inspectioning services essentially requires the use of equipment developed to the highest standard that is operated by trained personnel. However, one characteristic not provided by the Reduct technology itself, or our training programs, is the method by which the technology is delivered to site. Since pipeline assets to be inspectioned are typically only accessible during a specific time window any delays due to operational shortcomings are unacceptable. To help ensure optimal service quality and efficiency Reduct offers a customized Inspection vehicle to safely and efficiently store the standard Reduct pipeline mapping technology and any other related equipment. Once fitted out the vehicle would be ready for immediate operation at most locations. We have drawn on our experience of using our technology to provide mapping services and have designed a vehicle for optimal efficiency and economy. 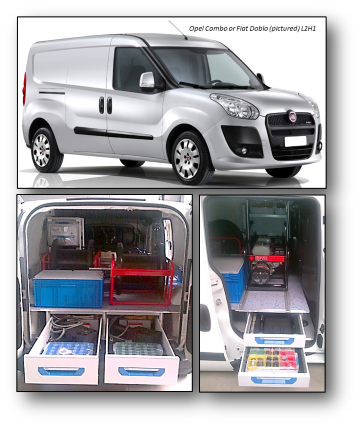 The vehicle we have selected is either the Opel Combo or Fiat Doblo which we then fit out with a bespoke Sortimo® based interior. It has been designed not only to house the Reduct technology but provides sufficient space for any additional inspectioning equipment and tools that may be required such as GPS location equipment, theodolite, GSR etc. The design meets all the current European safety requirements along with our exacting technical requirements. We believe the use of this vehicle will provide your operation with a total inspection platform for a consistently high service standard at the same time a giving a highly professional appearance to your customers. Contact Reduct for a detailed offer.